A simple formula will tell you just how far back you should sit from your big-screen TV to get the absolute best viewing experience. The whole point of investing in a home theater is to duplicate the experience of going to a commercial movie theater. Spending in excess of $100,000 for gear and construction in that endeavor is not unheard of; neither is it absolutely necessary. 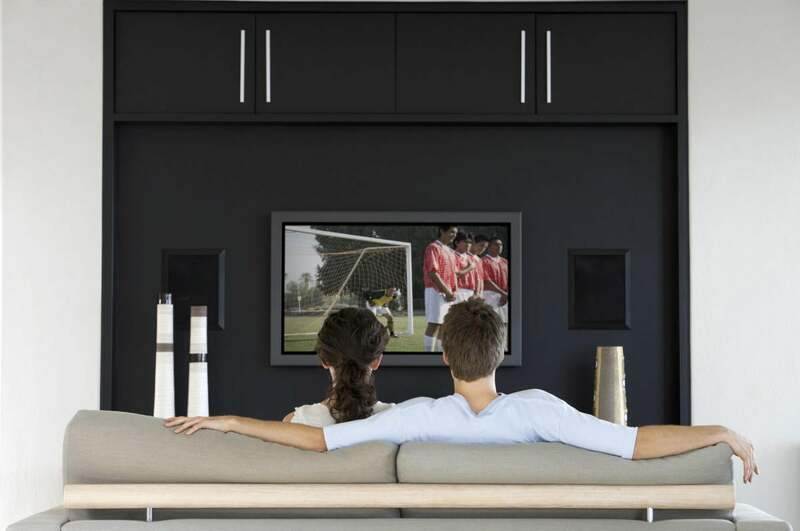 We’ll show you a simple formula that will maximize at least part of your home-theater experience: How far from your TV or projector screen should you sit in order to enjoy the best performance? When I go to a movie theater, I like to sit really close to the screen—usually in the third row. For a truly immersive movie—something like Gravity—I’ll often sit closer. I want the image to overwhelm my optic nerves. I don’t have that option at home with my 50-inch HDTV. I’d be so close to the screen that I couldn’t stretch my legs. Besides, sitting that close would ruin both the picture and the sound. In a theater, if you feel that you’re too close—or too far back—you can go to another row. In your home, moving closer or farther away requires rearranging the furniture. So it’s important to pick a good distance and to stick with it. But deciding where you want to sit can be complicated. Sit too far back, and you lose the details that you paid for when you bought your HDTV (even more so if you sprung for 4K). Sit too close, and the pixels become visible and distracting. So you have to find that happy medium. This diagram shows the audio and video sweet spot for this particular home theater, which has a 4K TV (although we're having difficulty imagining what that room would sound like with four subwoofers). For the moment, let’s stick to 1080p HDTVs. I’ll discuss 4K Ultra HDTVs soon enough. Every digital image is made up of a grid of colored dots or squares called pixels (short for picture elements). A 1080p HDTV has 1080 rows of 1920 pixels each. That’s 2,073,600 pixels total. That’s true if the TV is 30 inches wide or 120. The bigger the TV, the bigger the pixels—and the easier it is to see them. 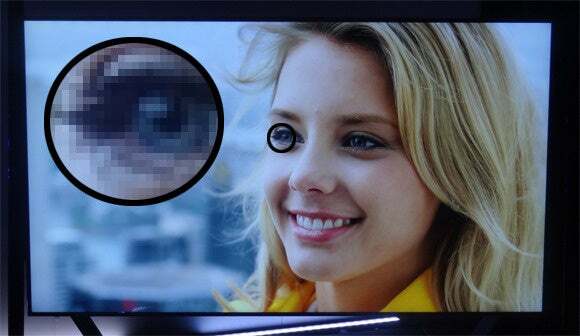 And that’s bad, because the pixels should be too small to see. The quality control company THX has a simple formula for calculating the closest you can get to an HDTV without seeing the pixels. Just divide the advertised TV size by 0.84 (remember that TV sizes are measured on the diagonal). So I should not sit closer than five feet from my 50-inch screen. If dividing by 0.84 seems to complex, here’s an easier approach. Assume one foot of distance for every ten inches of screen size. Look at the table below (based on the 0.84 formula) and you’ll it’s a very close approximation. We've done the math for you for these common flat-screen TV sizes. Not everyone agrees with THX’s numbers. The speaker manufacturer Aperion Audio recommends that you not sit closer than six and a half feet from a 50-inch 1080p set. Aperion also recommends you sit no farther than 9 feet 9 inches for the best experience. Home theater blogger Carlton Bale developed an Excel spreadsheet for calculating optimum distances depending on various criteria. This busy, small-print table can be intimidating at first glance. But it’s not that difficult if you have a 1080p HDTV. Enter the size of your screen in cell C8. 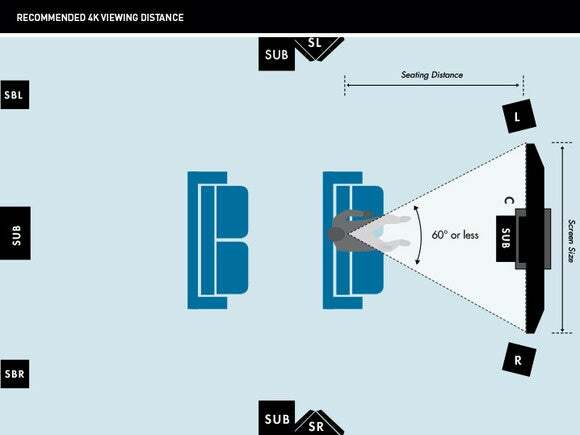 You’ll find various suggested viewing distances from row 31 to 35, with the easy-to-read numbers in column E. For instance, for the “SMPTE Longest Recommended viewing distance,” see cell E32. If you’re not sure what “SMPTE Longest Recommended viewing distance” means, hover over the label for a longer description. I might add that Bale’s “Shortest recommended viewing distance” is an absurdly short 2.6 feet for a 50-inch TV. A footnote explains that this is based on peripheral vision, not pixel size. As a test, I sat almost that close—39 inches—to my 1080p, 50-inch TV and watched a few scenes from large-format, immersive movies I own on Blu-ray. The pixels were annoyingly visible—especially in bright scenes. That hasn’t that bothered me in movie theaters, even when I’m sitting in the front row and the theater has only a 2K projector (with a resolution almost identical to 1080p). Eric Gemmer, Director of Imaging Technology at THX, explained why. “When you look at a TV,” he said, “pixel boundaries are set; they’re very solid…. On a projected screen, they’re smeared a little bit.” This smearing is more pronounced in a commercial theater, where the screen is perforated to let out sound from the speakers behind the screen. 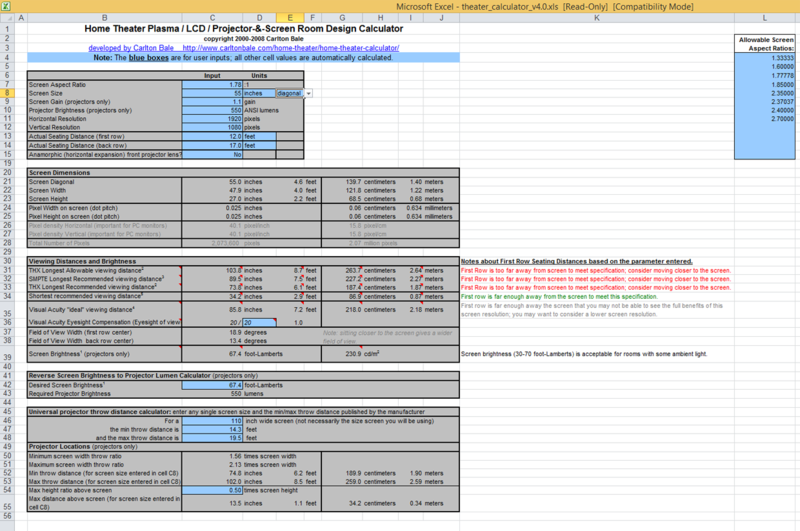 You can download Bale's Excel spreadsheet from his blog and enter your own parameters. The problem is audio. The left and right front speakers are farther apart than they should be, giving you a too-wide sound stage. So how do you calculate the proper distance? Another way to look at it is to consider your field of vision rather than the distance to the couch. For a 1080p TV, THX recommends that the screen take up no more than 40 degrees of your field of view. For 4K sets, THX increases that to 60 degrees. A digital image is made up of thousands of dots called pixels (short for "picture elements"). At this point, you’re probably wondering about the math. How do you figure out that the horizontal width of the rectangle in front of you doesn’t take up more than a 6th of a full circle? That’s a lot more complex than measuring the distance between a TV and a chair. Here’s how to do it: First, multiply the advertised, diagonal size of the 4K TV by 0.87. That formula tells you that a 50-inch set is 43.5 inches wide. Next, visit the Angular Size Calculator. Click the Distance button. Enter 60 for the angle (I’m assuming a 4K TV here). In the Size field, enter the width you calculated above. The result will be the closest desirable distance in inches. For a 50-inch TV, that’s just a bit over three feet. That’s still awfully close. Your TV has a fixed resolution, either 1080p or 4K. But the content you watch will vary considerably. Most Blu-rays are 1080p (the “p” indicates progressive scanning). All DVDs are 480p. Broadcast TV could be 480i (the “i” interlaced interlaced scanning), 480p, 720p, or 1080i. Streaming content? Who knows. It can change in the middle of a program, based on your broadband speed. When most TVs receive a lower-resolution signal, they'll will upscale it to the television’s native resolution—unless your DVR, cable box, Roku, or other device does it first. But there’s something you need to understand about upscaling: It doesn’t improve the picture. Sure, technically, the TV is displaying its full resolution. But a 480i signal upscaled to 4K still contains only 480i worth of image information. So if you place your chair close enough to become immersed in 4K splendor, many of the programs you watch will look pretty bad. 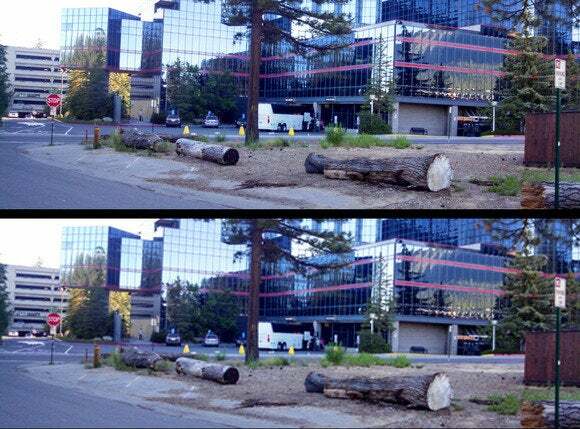 You probably won’t see actual pixels—the upscaling algorithms manage to hide that—but you’ll get blurry images. To get an idea of what you lose, consider these two images (click the photo below for more detail). The top image is the full resolution. The bottom image is the same picture, reduced to a quarter of its resolution, then upscaled back to its original size. This roughly shows what you’d get with an image shot with a 4K camera that’s reduced to a 1080p stream or Blu-ray and then shown on a 4K TV. Upscaling from a lower resolution to 4K can't add any visual information that's not in the image to begin with. 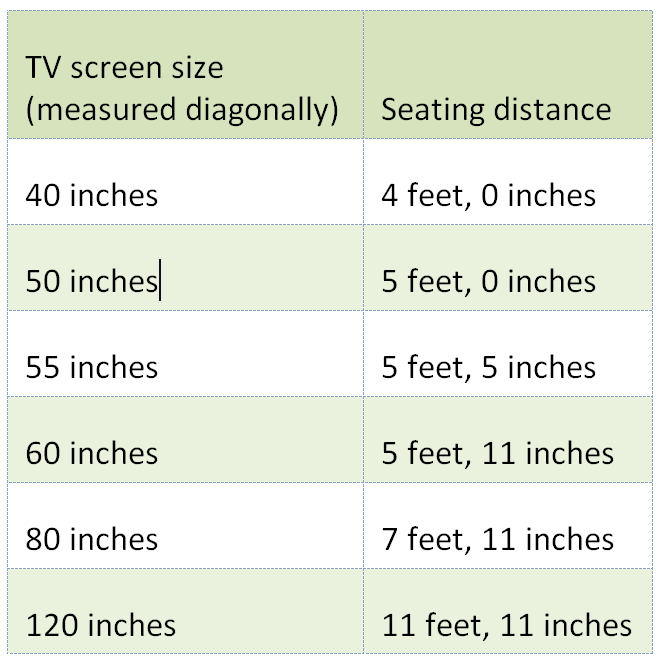 You therefore might want to keep your chair a bit farther from the TV than is optimal for using all that the television can deliver. Or, if the chair is light enough, you can always move it back and forward. Despite what your parents told you, sitting too close to the TV isn’t bad for your eyes or your health. But what about eye strain? According to Dr. Lee Duffner of the American Academy of Ophthalmology, “sitting too close to a TV will not damage your eyes but it may cause eyestrain.”That problem that can be cured by a good night’s sleep. But that’s not to say that watching TV is a healthy activity. Time spent sitting or reclining is time that you’re not getting physical exercise. I know. You just want to sit back, relax, and watch TV. You don’t want to fiddle with spreadsheets, pull out a measuring tape, and calculate degrees into inches. And you certainly don’t want to be told that you need more exercise. You’re best off mixing these numbers and calculations with a little common sense—and your own taste in what looks good to you personally. No one told me that I should sit way down front in a movie theater. In fact, people have been telling me not to so for most of my life. I don’t listen to them.